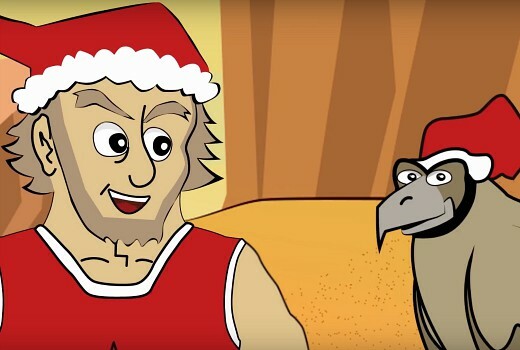 Animated TV special An Outback Christmas will air this Friday on NITV. The 30 minute Queensland produced special from Queensland-based Green Leaf Entertainment features the story of Bluey, an Australian Blue Heeler who needs to get home to his parents house to celebrate Christmas Day. He meets a digeridoo obsessed emu, a wisecracking echidna and a kangaroo who just wants air conditioning and lettuce leaves. He also discovers an international secret about the jolly man in the red suit. Guest voices include announcer John Deeks, Ilai Swindells (Open Slather), Brisbane radio announcers Louise Poole and Daniel Thomas and singer/performer Mitch Tambo. Producer / Writer / Director Shannon Morris hopes to continue Bluey’s adventures in a series and annual special. “In the USA, Christmas specials like Little Drummer Boy and A Charlie Brown Christmas were produced in the 60’s and have aired every Christmas since to huge television numbers. Why can’t we do the same here?” he asked. Friday 8 December at 7.30pm on NITV. I like watching NITV because their programs are always gay-friendly. I know they probably haven’t designed it that way but when I tune in I can be safe in the knowledge that Craig Kelly or Andrew Bolt will not suddenly pop up and spew their hatred.